A long time ago I decided that I wanted to make my own telescope mount. This is a large project, and takes a long time to complete. The project is far from finished, but this page hopefully shows my progress and I will add more details over time. There are various reasons for wanted to build your own telescope mount instead of buying one. 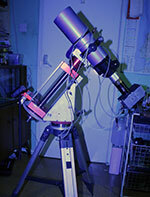 Time, satisfaction and cost A decent telescope mount for astrophotography starts at around £1000. Whilst a homemade mount might cost a fair bit, it is nicer to spread this cost over a couple of years. Simply taking astrophotography with purchased kit is no fun - anybody with a bit of intelligence can duplicate this: Making decent images with a mount you've made yourself is very satisfying. 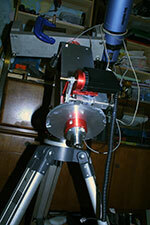 Portable I have a fixed observatory and like to do long integrations of several hours on narrowband targets. I rarely, if ever take my telescope to a dark sky site. Most, if not all, commercial amateur telescope mounts are full of design compromises to make them portable. Strip away the need to move it, and lots of things get very simple. Fixing and improving By definition, anything you make yourself can be repaired and maintained by yourself! It also goes to say that any failings are your fault - which is often nice to know! Over engineered Telescope mounts like to be large solid things. When making our own telescope we are free to chuck as much metal at the project as we can afford - the thing can be 10 time stronger than it needs to be. A strong mount is a good mount. Tracking. Periodic error must be kept low (less than 1 arc minute) and more importantly smooth. Making our own telescope mount worm gears allows us to polish them as much as we like. Sturdy. A german equatorial telescope mount is basically two rotating axis held perpendicular to each other and supported by large wodges of metal in the right places. Each axis is simply a flat plate about 400mm long with a bearing housing at each end. Shaft. Whilst we would like to use a huge shaft, the maximum size of shaft and bears is dictated by cost and the size of the mini-lathe. I have settled on a 30mm diameter hardened steel shaft with 62mm outer diameter bearings. Bearings. Another critical bit. 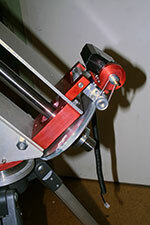 THe bearings on a telescope mount are subjected to huge radial and axial loads. Unlike most bearings applications, they move very slowly - once a day. I use decent quality branded SKF bearings. The best type of bearings to use in this application are double row angular contact bearings. However, getting two bearing bores concentric along a foot long bearing plate is a nightmare, so we use a double row angular contact bearing pair with a self aligning bearing on each axis. The base. Once the two axis are bolted together and turning nicely, we have to attach them to a pier. A strong base which can be adjusted in Az and Alt for polar alignment is needed. A heavy telescope on the end doesn't want to twist or bend the base - this is the one area that commercial mounts fall down on. The Drive. I use some spare Autostar motors I have for driving the scope. Although slewing is very slow, the computerised functions make GOTO and autoguiding simple. This is the main view of my homemade DIY telescope mount. Only the RA axis is complete and a small telescope is bolted to the frame of the dec axis for testing the RA axis. The RA worm gear wheel is in the bottom left and the shaft can be seen passing through the red bearing blocks. The Alt adjustment handle can be seen poking out of the right hand side of the base. 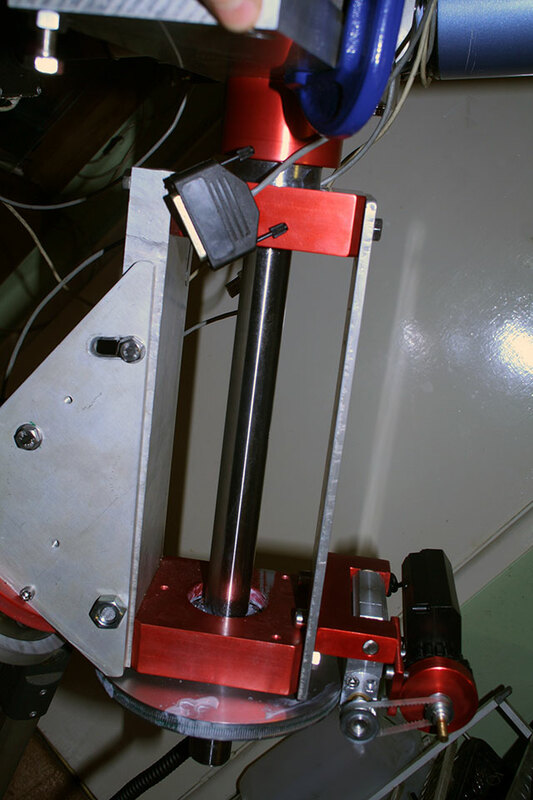 Here is a close up of the RA axis of the telescope mount. We can see the worm gear holder and motor driving it via a pulley. The bearing block on the left contains the double row angular contact bearing and the other at the bottom contains the self aligning bearing. Here is the rear view. At the top we can see the unfinished DEC axis of the telescope mount. At the bottom is the worm wheel for the RA drive. This is a close up of the RA drive section. The worm wheel is clamped to the shaft and the worm gear is spring loaded to press against the worm wheel. The Autostar motor is bolted to the top of this and drives the worm gear via a pulley. All the red parts have been anodised.